When I was in college, it was such a treat to go downstairs to my P.O. box and find a slip of paper in it. That slip of paper meant that I had a package. Packages in college usually meant food.... good food.... usually in the form of cookies. These cookies were one such favorite that my grandmother used to make and send to me while I was away at school. 2. Cream the butter and sugar together. Add the egg, milk, and vanilla. Beat until light and fluffy. 3. Combine the flour, cocoa, baking soda, and salt in a separate bowl. Beat this into the creamed mixture. 5. Bake for 8 minutes. 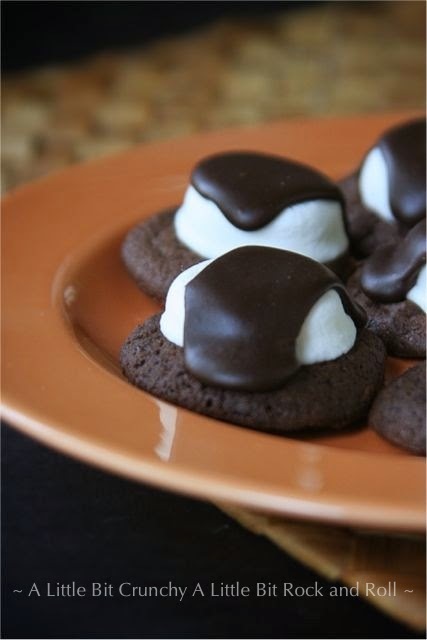 Press a marshmallow half, cut side down, onto each cookie. Return to the oven for 2 more minutes. Cool completely on a wire rack. 6. For the frosting, combine the butter, cocoa, and milk in a small saucepan. Bring to a boil and cook for 1 minute, stirring constantly. Cool slightly and transfer to a small mixing bowl. Beat in the powdered sugar and vanilla. Pour over the cooled cookies. Makes about 3 dozen or more depending on the size cookie scoop you use.